I have this chiffon pan not the regular chiffon pan that you might have in your kitchen. I bought this pan made in Indonesia, has a lower height and smaller size and shape. that is why i don't get a brown side and bottom of my cake like the regular chiffon in the picture. 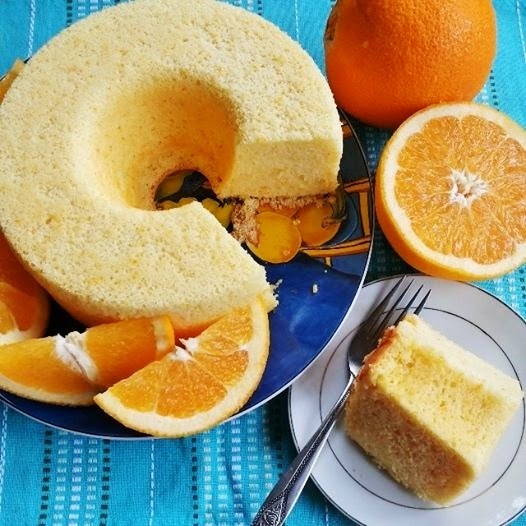 But anyway, still can bake a good looking chiffon cake looks no burn at all bottom and side...haaa...haaa..
My chiffon cake turn out great and no cracks, thanks god, the result pleases me that day! 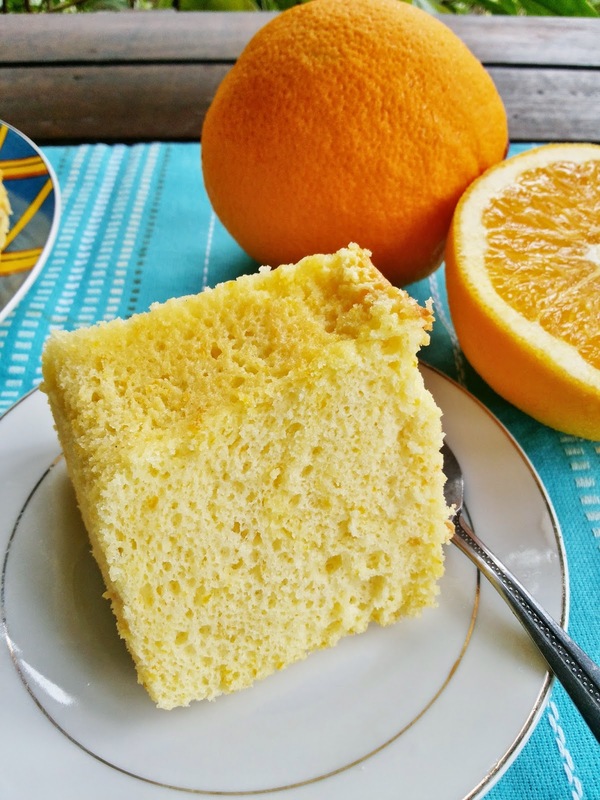 however, i might less down the amount of orange zest next time even thought i love zest but i find it slightly bitter in my cake, everything was perfectly good. Measure and prep ingredients as detailed above. Preheat oven to 200°C. Whisk egg yolks and 50 g castor sugar till thick and pale. Add corn oil. Whisk till thick again, like mayonnaise. Add orange juice. Whisk till evenly mixed. Re-sift sifted cake flour and baking powder into bowl. Add salt and orange zest. Mix till just even. Set aside. Thoroughly wash whisk. Whisk egg whites till very frothy. Add cream of tartar. Keep whisking till egg whites are thick. Gradually add 50 g castor sugar whilst continuing to whisk. Keep whisking till egg whites reach firm peak stage. Add to yolk mixture in 3 batches. Mix with whisk till almost even after each addition. Scrape down thoroughly with spatula. Fold till just evenly mixed. Bang bowl against worktop 2-3 times to remove big air bubbles in batter. Pour batter into 21 cm loose-bottomed chiffon pan that's not non-stick, slowly so that big air bubbles burst as they flow out of bowl. Level batter with spatula. 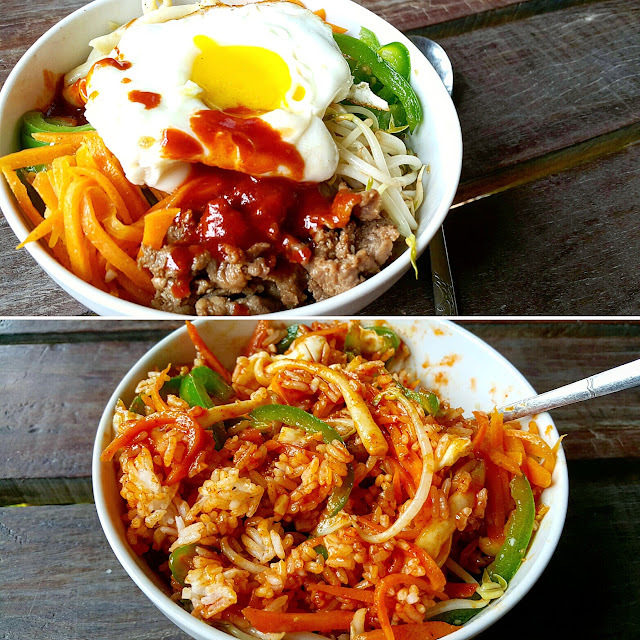 Run chopstick around sides of pan and knock pan 2-3 times against worktop to get rid of more big air bubbles. Place cake in lower oven. Reduce temperature to 180°C. Bake till cake is level with pan and slightly golden brown, about 20 minutes. Place baking tray in top of oven to block heat from top of oven. 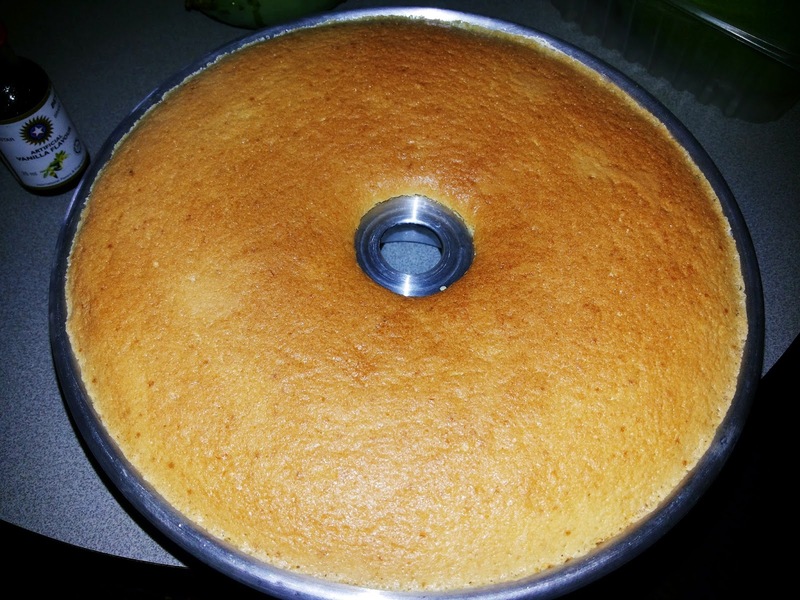 Continue baking till cake is brown and slightly springy when pressed, another 20-25 minutes, rotating as necessary so that cake browns evenly. Remove cake from oven. 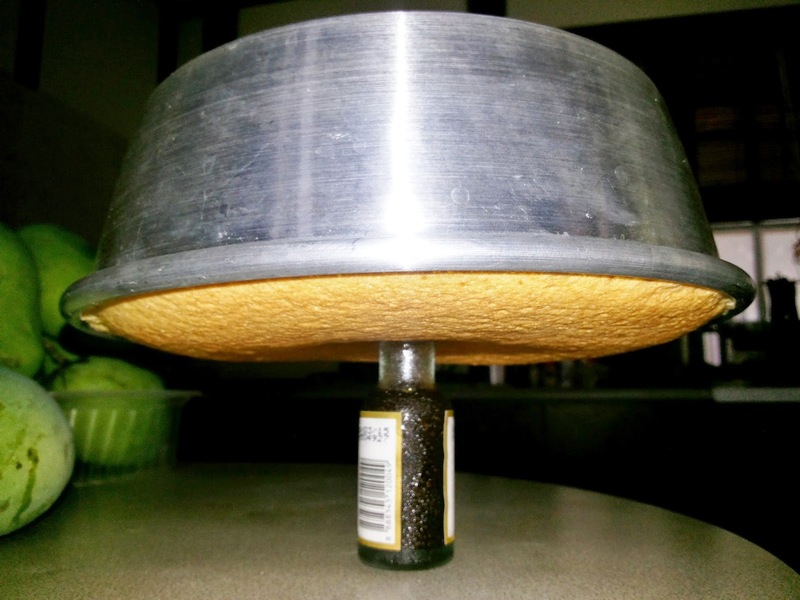 Invert and rest cake elevated from worktop. Leave till cool. 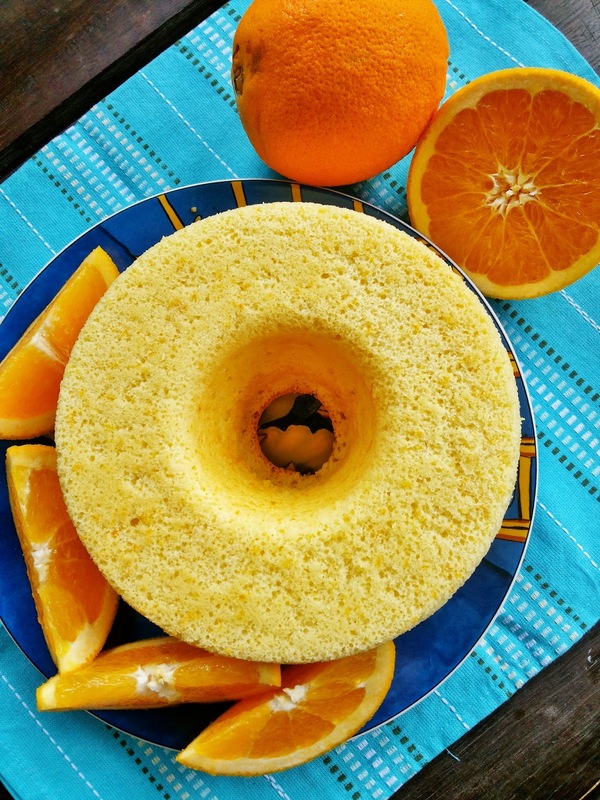 Un-mould by cutting cake out of pan. Slice and serve.